At farmers markets in California, the tomatillo season is similar to tomato season, running from July through October. Tomatillos are slightly sour, sharp and fruity, a combination which is delicious counterpoint to the mellow, round flavors of a corn tortilla and the creaminess of a melting cheese like Monterey Jack. Roasting is an especially good treatment for these little green gems, as it draws out some of the natural sugars, then caramelizes them and adds a hint of smokiness. I first used all of the tomatillos to make a thick, slightly chunky tomatillo salsa (recipe below). Then, later in the week, I took the remaining salsa, and converted it into a thin, smooth sauce to use in enchiladas verdes, the process for which I will describe below. When the oil is hot, carefully pour in the salsa (it might splatter). When it is safe to do so (a few seconds later), stir the mixture thoroughly. Reduce the heat to medium, and cook the salsa, stirring frequently, until it thickens to the consistency of tomato paste (about 10 minutes). Pour in some water or broth, enough to make the final mixture about as thick as tomato sauce. Puree the mixture using an immersion blender or countertop blender (being careful with the hot liquid in the blender). Keep the mixture warm over low heat until the tortillas are ready. 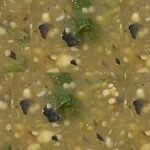 A classic tomatillo salsa that can be used as a topping for tacos, a dip for chips, or the base for an enchilada sauce. Place unpeeled garlic cloves and serrano chiles in a dry skillet over medium heat. Cook, turning them occasionally, until the garlic is soft and the chiles are blackened, about 10-15 minutes. After they cool, peel the garlic and remove some of the seeds and membrane from the chiles (the membrane contains the chile's heat). 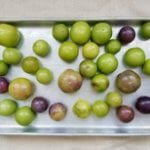 Peel husks from tomatillos, then wash them thoroughly. 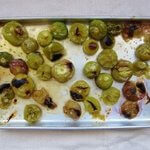 Put tomatillos on a baking sheet (use one with sides since there will be juices running). Place under broiler. Put the chopped chiles and garlic into a blender jar. Add a few tomatillos. Blend until smooth. This step allows the garlic and chiles to be fully pureed. Add the rest of the tomatillos, then blend lightly to break them up without making the mixture totally smooth. Pour into a serving or storage dish. Put the onion in a colander and put under running water for a few seconds to reduce the bite. Add the onion. Add salt, chopped cilantro and lime juice to taste. Stir to combine. For a more precise description, check out Rick Bayless's Mexican Kitchen and Mexico: One Plate at a Time. Since tomatillo salsa/sauce is so important in Mexican cooking, Bayless frequently makes a version on his TV show.